A Robbins Main Beam Hard Rock TBM bored the tunnel and broke through at the end of August 2017, bringing the project one step closer to completion. The TBM, also known as "Keri," has been owned by project contractor Kenny Construction since the 1990s and has been used on several projects prior. "The machine holed through into the inlet shaft," said Clay Spellman, Project Manager for Kenny Construction. "We excavated the shaft as part of the project. The machine has since been disassembled and removed." For the Albany Park Project, Keri was rebuilt by Kenny Construction with size modifications designed by Robbins. Robbins took an existing cutterhead, repaired it, and then added segments, taking it from 5.2 m (17.2 ft) to 6.2 m (20.4 ft) in diameter. "Extensive modifications were also made underground to the machine to be able to install rock dowels and stand the ring steel under the roof shield," added Spellman. 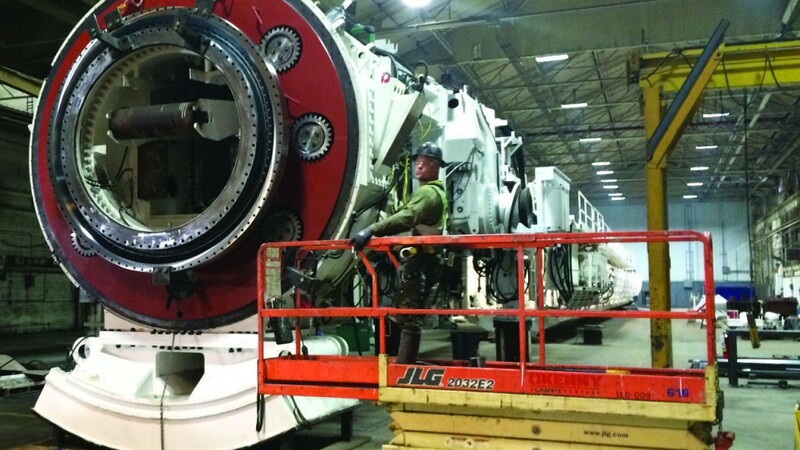 "Rebuilding TBMs has always been a core part of Robbins' business. Most customers immediately recognize that a rebuilt machine with updated systems can offer exceptional value without increasing risk, and a rebuilt machine can usually be delivered faster," said Robbins Engineering Manager Steve Smading. "While the financial and schedule advantages are obvious, the flexibility of used equipment may be less obvious. Boring diameters can be increased or decreased and machine configurations can even be changed. For example, a Single Shield can be reconfigured as a Double Shield or vice versa, and a Main Beam TBM can be reconfigured as a shielded machine. Soft ground machines can be configured for different geologies and can be set up as either Slurry or EPB." Over 50 percent of all Robbins Main Beams ever manufactured have been used on three or more projects. Incredibly, many Robbins TBMs that have been used on multiple projects are approaching over 50 km (31 mi) of use. Prior to its ownership by Kenny, Keri has successfully bored tunnels in the Dominican Republic, Saudi Arabia, New York, and Chicago—totaling at least 19.5 km (12 mi) of tunnel. Due to the project location in a residential neighborhood, there were restrictions in place as to when the machine could operate and the frequency at which blasting would be allowed per day. Despite these limitations, the TBM achieved a best day of 39.5 m (129.7 ft) and a best week (5 days) of 146.4 m (480.4 ft). The machine bored through dolomite with an average compressive strength of 64 MPa UCS (9,300 psi). "During boring we encountered approximately 30.4 m (100 ft) of fractured ground that had to be supported with rolled channels, straps, and 19 full circle steel rings," said Spellman. The drainage tunnel starts in Eugene Park and extends for approximately one mile under Foster Avenue to the North Shore Channel. When the Chicago River's water levels reach flood stages—exceeding 2 m (7 ft)—the tunnel will divert a flow of 65 cubic meters (2,300 cubic ft) of water per second, avoiding Albany Park, then deposit it into the Channel. The tunnel will essentially be transferring the water where it would have ended up, without damaging the residential area or adversely affecting the river's wildlife.